Central Statistics Agency (BPS) informs that Indonesia’s export value in March 2018 reaches US$ 15.58 billion, or increased by 10.24 percent compared to the value in February 2018 and increased by 6.14 percent compared to the value in March 2017. “Non-oil and gas export in March 2018 reaches US$ 14.24 billion, increased by 11.77 percent compared to February 2018, and increased by 8.16 percent compared to non-oil export in March 2017,” Head of BPS Suhariyanto said in a press statement at the Main Office of BPS, Jakarta, Monday (4/16). Suhariyanto further said that cumulatively, Indonesia’s export value from January to March 2018 reaches 44.27 US$ billion or increased by 8.78 compared to the same period in 2017, while non-oil export reaches US$ 40.21, a 9.53 percent increase compared to the same period in 2017. According to Suhariyanto, the biggest increase of non-oil export in March 2018 to February 2018 is fuel with US$ 358.9 million (18.58 percent), while the biggest decrease is tin with US$ 92.5 million (45.25 percent). Suhariyanto added that non-oil and gas export from January to March 2018 increased by 4.60 percent compared to the same period in 2017, while export of mining and other products increased by 41.48 percent and agricultural export decreased by 9.32 percent. Suhariyanto further explained that the biggest non-oil and gas export in March 2018 is to China amounting to 2.36 billion US$, followed by the United States US$ 1.59 billion and Japan US$ 1.43 billion. Their contribution reaches 37.78 percent. In the meantime, export to 28 EU countries reaches US$ 1.53 billion. Suhariyanto added that based on the origin of Province of the goods, West Java contributes to Indonesia’s biggest export from January to March 2018 with US$ 7.53 billion (17.02 percent), followed by East Java with US$ 4.77 billion (10.77 percent) and East Kalimantan with US$ 4.59 billion (10.37 percent). Regarding import, the value of Indonesian import in March 2018, according to Suhariyanto, reaches US$ 14.49 billion or increased by 2.13 percent compared to February 2018, and increased by 9.07 percent compared to March 2017. Non-oil import in March 2018 reaches US$ 12.23 billion or increased by 2.30 percent compared to February 2018, and increased by 11.08 percent compared to March 2017. Oil and gas import in March 2018 reached US$ 2.26 billion, increased by 1.24 percent compared to February 2018, and decreased by 0.64 percent compared to March 2017. 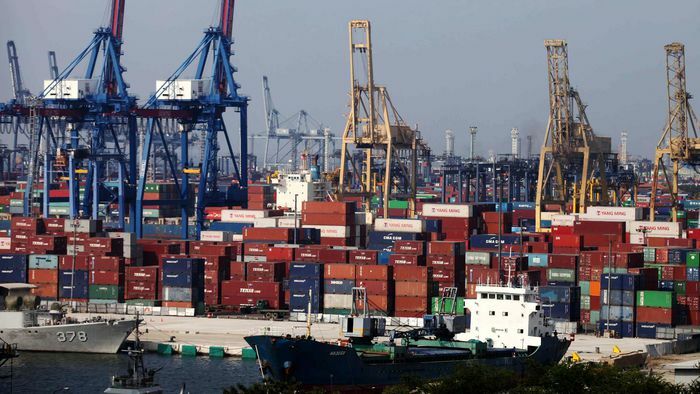 Suhariyanto further said that the biggest increase in non-oil import in March 2018 compared to February 2018 is from machinery and mechanical plane with US$ 286.9 million (14.84 percent), while the biggest decrease is machinery and electrical equipment with US$ 153.1 million (9.19 percent). Suhariyanto added that the biggest non-oil import during January-March 2018 is from China with the value of US$ 10.16 billion (27.30 percent), Japan US$ 4.33 billion (11.64 percent) and Thailand US$ 2.57 billion (6.89 percent). In the meantime, non-oil import from ASEAN is 20.84 percent, while from EU is 9.41 percent. The import value from consumer goods, raw materials / auxiliaries and capital goods from January to March 2018 increased by 22.08 percent, 18.35 percent and 27.72 percent respectively, he concluded.